The Prothonotory Warbler located yesterday continues to be seen and heard at Black River Rd. (Bedminster Twp. ), at the bridge just south of Long Lane at 6 pm. The Fish Tract is a former farm acquired by the borough of Florham Park. It lies next to the Passaic River and East Orange Water Company property. It flooded with the rain storms of early spring and continues to be flooded. Habitat around the water’s edges has attracted the following: 2 Hooded Mergansers, 4 Great Blue Herons, 2 Great Egrets, 3 Killdeer, 2 Spotted and 3 Solitary Sandpipers and 4 Greater Yellowlegs were found before an unfortunately misguided young lad on an ATV flushed most of the birds away. Mosquitoes are especially nasty (J. Klizas). Below are two heavily cropped photos from this afternoon. Hooded Mergansers, Florham Park, NJ, May 27, 2014 (photo by Jonathan Klizas). 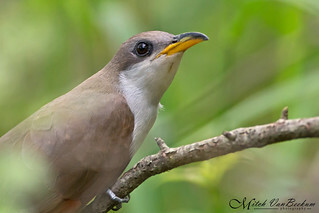 Here is a photo of a Yellow-billed Cuckoo at Troy Meadows taken today by Mitch Van Beekum.